Ask A Gleniffer Lake MARKET EXPERT! Great buy on this Amish-built 12' X 44', 2 bedroom Park Model. Extensive woodwork and attention to detail show the quality of craftsmanship in the construction of this unit. The spacious living area is in show home condition. There is a large master bedroom and second bedroom with 4 bunks. Fully furnished including a large flat screen TV. Fenced yard with a modern shed and 2 decks. Just steps from the natural walking trail and across from Marina Park. 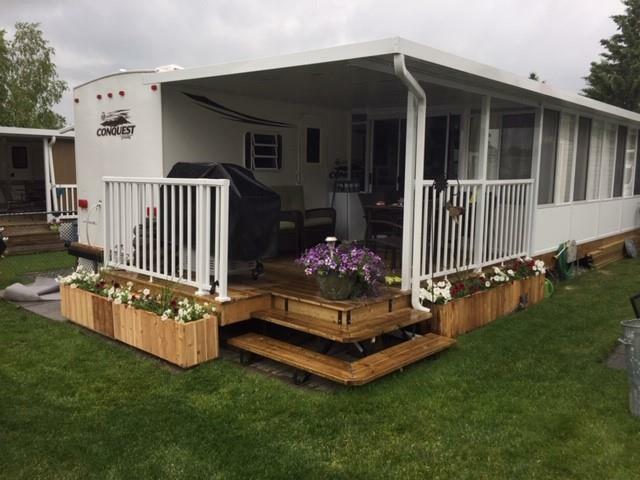 576 Carefree Resort, Rural Red Deer County, Alberta, MLS® C4173032 T4G 1T8 is a Land, 2 bedrooms, 1 bathrooms, approximately 528 Sq. Ft. Listing price 135,500.00. This property was built in 2005.